1. Russell Wilson has targeted Tyler Lockett 51 times, resulting in 44 completions, 713 yards, nine touchdowns, and zero interceptions. In other words, Wilson has a perfect passer rating (158.3) when targeting Lockett this year. 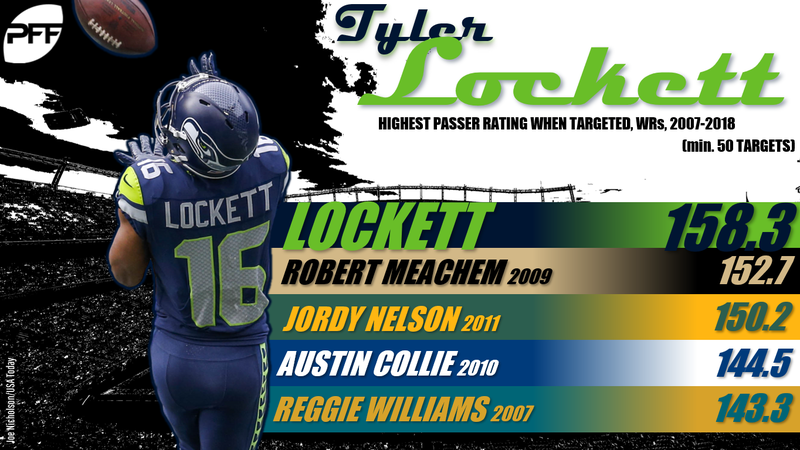 If the season ended today, Lockett’s 158.3 WR Rating would be the new PFF-era (2007-2018) record for all wide receivers with at least 50 targets. On Sunday, Lockett caught one of two targets for 52 yards and a touchdown. Lockett has now scored a touchdown in nine of 12 games this year. He’s also reached at least 50 yards in nine of 12 games. That’s pretty impressive, but when we factor in Lockett’s production relative to usage, his numbers are almost hard to comprehend. Among wide receivers, he ranks 17th in fantasy points, but just 57th in targets. Lockett not only leads all wide receivers in fantasy points per target (3.32) but is 26.6% better than the next-closest wide receiver (Tyreek Hill). Lockett’s efficiency numbers might look even more absurd when considering his production on deep targets (balls traveling 20 or more yards through the air). Lockett ranks second in receptions (11), second in yards (410), and first in touchdowns (seven) on deep targets, but he ranks just 27th in deep targets (14). All of this is evidence for a looming regression, due to unsustainably high efficiency numbers, and I’ve made that argument before in his space. However, now, due to a more robust sample size, I’m far less bearish than I was earlier in the year. I still think a regression is coming, but I wouldn’t be shocked if Lockett continues to produce as one of the league’s more efficient wide receivers for the remainder of the season. Since we’ve seen it before from Doug Baldwin (2015-2017), perhaps “Seattle WR1” is just a role that can reliably produce hyper-efficient numbers. 2. 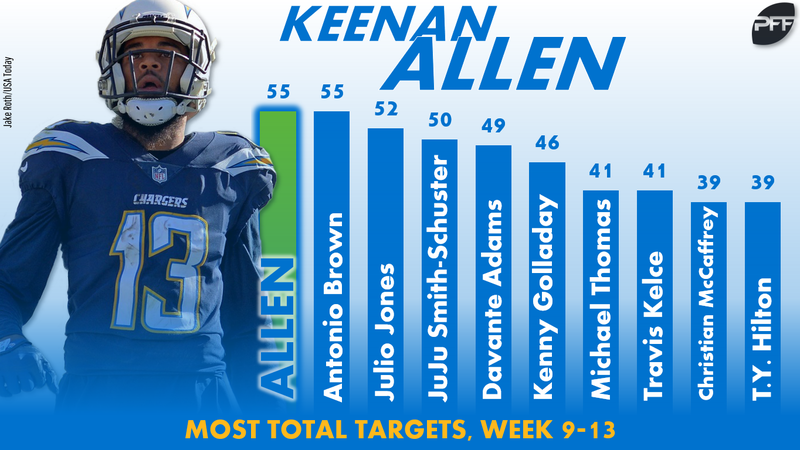 Following his mini-meltdown in Week 7, when he complained about a lack of targets, Keenan Allen has seen a substantial uptick in usage. Week 9 to now, since the team’s bye week, Allen leads all wide receivers in targets per game (11.0), fantasy points per game (23.0), and target market share (34%). Through his first seven games, he averaged just 7.3 targets and 13.9 fantasy points per game, with a 23% target market share. This might be a theme with Allen, who also had glaring first- and second-half splits last year. After a somewhat pedestrian start to the 2017 season (12.2 fantasy points per game), Allen exploded over the final seven weeks, averaging 23.9 fantasy points per game. Over this span, he outscored the next-closest wide receiver by 27 fantasy points and the second-closest wide receiver by 42 fantasy points. After another monster game on Sunday, and with Melvin Gordon still banged up, I think there’s little reason to suspect Allen doesn’t finish strong for fantasy yet again. 3. 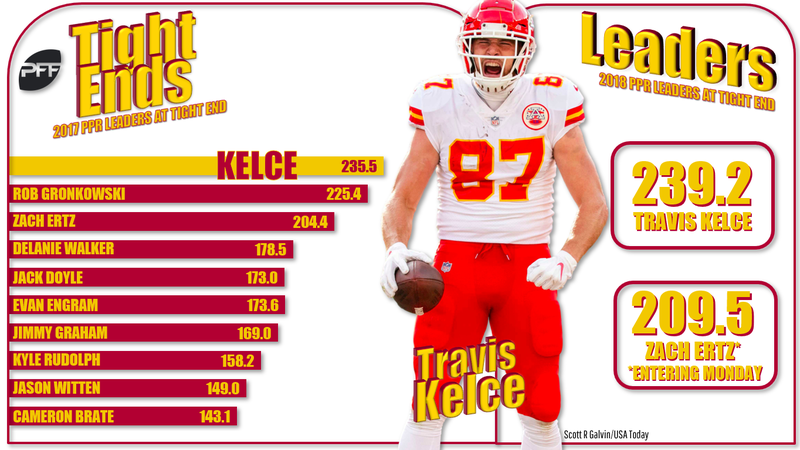 Travis Kelce is averaging 19.9 fantasy points per game, which leads all tight ends, and would rank sixth-best among all wide receivers. Zach Ertz isn’t far behind Kelce, averaging 19.0 fantasy points per game entering Monday night, a number that would rank 10th among wide receivers. However, after them (or maybe after Eric Ebron and George Kittle) it’s a pretty steep drop. The tight end position has been injury-plagued and wholly underwhelming this year, making the few studs at the top really stand out. Kelce averages 7.9 fantasy points per game more than the tight end ranking sixth at the position in fantasy points per game (O.J. Howard), and he averages 10.5 fantasy points per game more than the tight end ranking 12th (Trey Burton). That’s a massive weekly advantage for Kelce owners. Though there are five wide receivers ranking above him in fantasy points per game, you can make the case that, due to positional advantage, he offers more value than any of them. 4. Dalvin Cook currently leads all 47 running backs with at least 100 touches in missed tackles forced per touch (0.29). Over the past two weeks, Cook ranks as one of our three highest-graded running backs. On Sunday, Cook saw just nine carries, but managed 84 yards (with three missed tackles forced) on the ground. He saw even better volume through the air – a season-high 10 targets – but was less efficient, catching eight for just 22 yards. It’s hard not to think of Cook as a fantasy bust if you drafted him at his second-round ADP, but he has played well on a per-touch basis – unfortunately, there just hasn’t been a lot of them. Perhaps that starts to change in coming weeks. Cook’s lack of volume is partly injury-related, getting eased back into playing time following a hamstring injury, and he has seen better volume in recent weeks. Over Minnesota’s last three games, Cook has played on 74% of the snaps while drawing 66% of the team’s touches out of the backfield. Total volume was low, but it was low for all running backs, as gamescript forced a more pass-heavy approach. 5. Patrick Mahomes is averaging 28.6 fantasy points per game. Not only is this the most by any quarterback in any season all-time, but, in standard leagues, it’s the most by any player at any position in any season all-time. Even by PPR scoring, it’s the sixth-most by any player at any position in any season all-time (and third-most by half-PPR scoring). Over the past few years, the “late-round QB” draft strategy has been the dominant strategy espoused by experts when discussing the position. With Mahomes averaging 5.9 fantasy points per game more than the next-closest quarterback, it wouldn’t shock me if Mahomes crept up into the first round of 2019 fantasy drafts.